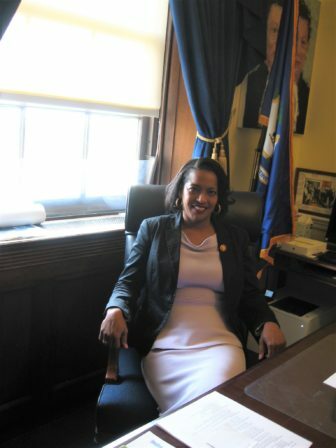 Rep. Jahana Hayes in her office in the Longworth House Office Building. Washington – After another long day at work, Rep. Jahana Hayes spent the evening sitting on the floor of her office, surrounded by briefing papers and other documents that would help her prepare for a match up with Education Secretary Betsy DeVos. The match up was over an issue that has roiled educators and is of great concern to Hayes – the use of federal funds to arm and train teachers. As a former National Teacher of the Year who represents Newtown in Congress, Hayes, 46, has embraced both education and gun control as priorities. Now she had the chance to tackle both at once in a very public forum and she wanted to be prepared. The result the next day at a House Education and Labor Committee hearing was a fiery exchange with DeVos, whose education policies are anathema to many teachers and the powerful unions that represent them. 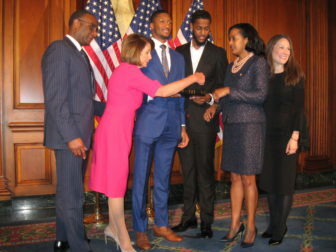 That public exchange garnered national attention, but it was a bit of an outlier for Hayes, who is one of the quieter members of a diverse, assertive and independent freshman class of House Democrats. During her first 100 days in office, Hayes has distinguished herself as a former teacher who is also willing to be a student when it comes to learning the ways of the U.S. Capitol and the complex subjects lawmakers must understand. Hayes said she was surprised by the intensity of the spotlight on her freshman class, which, among other things, led her to be profiled in a cover story for Rolling Stone magazine. “There’s been a lot of attention that I don’t think I was prepared for,” she said. Unlike fellow freshmen who posed on the cover of the magazine with her, Alexandria Ocasio-Cortez and Ilhan Omar, Hayes has eschewed the brasher style of others in her class for a more cautious approach to navigating the world of Washington politics. 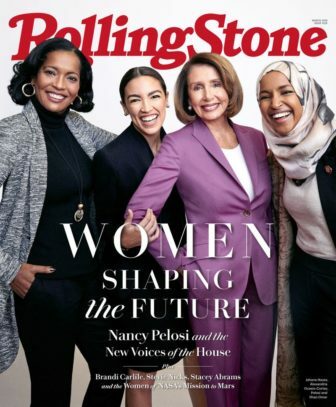 Jahana Hayes on the cover of Rolling Stone with U.S. Reps. Alexandra Ocasio-Cortez, D-N.Y., and Ilhan Omar, D-Minn., and House Speaker Nancy Pelosi. “She is one of the most interesting new Democratic women, but she is not at the forefront,” said Ronald Schurin, a University of Connecticut political science professor. Hayes said she admires her classmates. “I love it there are so many first-time elected officials in the class, because they are so raw,” she said. She said tries to reach out to as many fellow lawmakers as possible, including Republicans, often at a Thursday morning prayer breakfast held most weeks in the U.S. Capitol complex. “I’ve had side conversations with (Republican) members and then I think we’re aligned on the issues, then we vote very differently,” Hayes said. While Hayes has been taken aback by the bitter partisanship in Congress, she’s more affected by the hectic pace of her days. Besides hiring staff and setting up offices on Capitol Hill and in her sprawling northwest Connecticut congressional district, Hayes had to learn about the issues before the committees on which she serve –the Education and Labor Committee and the Agriculture Committee — and decide which informal congressional caucuses she would join. Those informal caucuses include the Congressional Black Caucus and the Gun Violence Prevention Caucus. Then there’s meetings with constituents who drop by her office, a flood of media requests –including many from student reporters, including one who was only in the 5th grade. There are also hearings to attend, votes to cast, and evening receptions, including those intended to raise campaign cash. On a recent day, Hayes was picked up from her rental apartment near the U.S. Capitol and was at her office by 7 a.m. She attended a Democratic caucus meeting, then rushed to give a speech at a gathering of the Council of Chief State School Officers, the group that runs the Teacher of the Year program. Then it was back to the Capitol for a hearing on insurance and a meeting with Education and Labor Committee staff. Also, at some point during the day, Hayes hustled to the House chamber for roll call votes. Between those votes she ran outside to pose on the Capitol building’s steps with visiting students from Connecticut. To try to deal with conflicting demands, many lawmakers have their staffs schedule them in 15-minute blocks of time. That doesn’t work for Hayes. Jahana Hayes campaigning outside the Democratic convention, where she lost the party nomination to Mary Glassman. Hayes then challenged Glassman in a primary and won. Hayes’s background helped define her campaign for Congress. 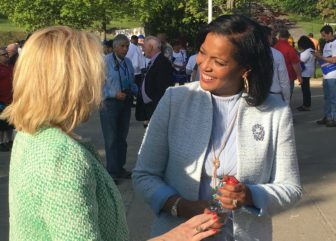 The first black Democrat to represent Connecticut in Congress, she has an inspiring life story. Hayes grew up with her grandmother in Waterbury’s toughest housing project and became a teen-age mother, like her mother and grandmother, at 17. Her family struggled with substance abuse, relied on public assistance, and once even lost their apartment. She has a stylized map of Waterbury on the wall of her congressional office, along with whimsical portraits of Supreme Court Justice Ruth Bader Ginsburg and poet Maya Angelou, their faces painted in triplicate by Connecticut artist Jack Rosenberg. Still, the office still feels a little like a work in progress — maybe because Hayes occupies it so infrequently, being so busy elsewhere. “I spend very little time in the office,” she said. When she does, callers to her office are shocked when she gets on the phone with them. Many of the phone calls are supportive. Some are not. Hayes won the seat of retired Rep. Elizabeth Esty, a Democrat whose politics were more moderate and business -oriented. Hayes, meanwhile, is an unvarnished progressive, with a firm belief in both the social programs that helped her family and the public schools that led her to a college education and a career. Conservatives have attacked Hayes for her support of Medicare for All and the Green New Deal, an aspirational proposal championed by Ocasio-Cortez that aims to combat climate change and promote social justice. Already, Hayes’ support for the Green New Deal has spawned an attack ad by a conservative political action committee. Hayes hadn’t planned to trade the schoolhouse for the U.S. Congress. She was encouraged to run by Sen. Chris Murphy, who held the 5th District congressional seat when he was in the U.S. House of Representatives. Murphy is an informal mentor and his former policy director, Joe Dunn, is now Hayes’s chief of staff. And Hayes has other influential friends in Congress. House Majority Whip James Clyburn, D-S.C., the highest ranking African-American in Congress, became aware of Hayes because of a controversy at the 2018 5th District Democratic convention. House Majority Whip James Clyburn, D-S.C. In an event marred by accusations of dubious vote switching, rival candidate Mary Glassman squeaked out a narrow victory over Hayes at that convention. Clyburn helped raise money for Hayes’ primary campaign, but did not meet the new congresswoman until last September, when they both attended the Congressional Black Caucus legislative conference in Washington D.C.
Clyburn said he was impressed Hayes was a former history teacher, as he once was. “There was just this real natural connection that we had,” he said. He said he’s schooled Hayes, who has never held elected office before, in the legislative process and urged her to use her experiences, as a teacher and “ambassador” to many communities as 2016 Teacher of the Year to win support from colleagues for her legislative priorities. Hayes joined Congress just as her party took over control of the U.S. House from the Republican Party. House Democrats now have the ability – and numbers – to get their priorities through the chamber. But many of the bills approved in the House will die in the Senate, which is still under Republican control. Hayes cited, among other major House accomplishments this year, a bill that would expand FBI background checks of gun buyers to individual sales on the internet and at gun shows, and another bill, sponsored by Clyburn, aimed at closing the “Charleston loophole,” a gap in the background check system that allowed a man to purchase a gun and kill nine members of a South Carolina church four years ago. Known for her optimism and megawatt smile, Hayes has also revealed her tough side. 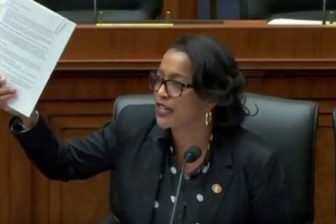 At a closed-door meeting of House Democrats, Hayes challenged House Speaker Nancy Pelosi on a resolution that was in the works aimed at responding to GOP charges that fellow freshman Omar had made anti-Semitic remarks. Hayes protested the evolving resolution was being pushed too quickly by Pelosi to the floor and lawmakers had not seen a final draft. Rep. Jahana Hayes shows Education Secretary Betsy DeVos a memo during a confrontation over using federal funds to arm teachers. Then there was the confrontation with DeVos. Sometime after she was sworn into office, Hayes had a private meeting with DeVos. “I said to her ‘I need for you to be successful so kids can be successful,’” Hayes said. But at the recent hearing on the Department of Education’s budget, Hayes would not allow DeVos to insist she had no authority to tell school districts whether they could use a certain federal education grant to arm and train teachers. “I would like to submit these documents for the record so that the secretary has the ability to read the memo that came from her office,” Hayes added. Clyburn said years as a teacher have toughened Hayes’s spine. “You can’t be a pushover in a classroom,” he said. Hayes divides her time between the nation’s capital and her home in Wolcott, attending events in the state when Congress is not in session. Hayes also has three grown children and a husband, Milford, who is a police officer. The research shows that while students of all races are more likely to get arrested at a school with a resource officer, Latinos are particularly impacted.